An impressively solid album that should please the power metal cognoscenti. Wardrum may be a new band, but the quartet is comprised of seasoned players, including a vocalist who has worked with Uli Jon Roth and Greek musicians who have played together in a number of bands (and most recently Horizon’s End) for quite a while. 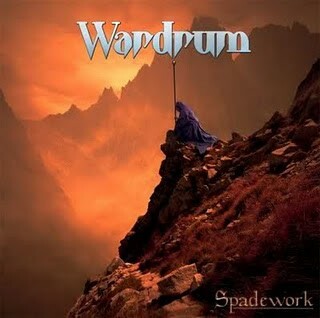 And it really shows, because in ‘Spadework’ we have an album of exuberant power metal that here and there is sprinkled with classic metal influences and also some progressive stylings. It is also an album of well-written songs complete with strong melodies, instrumentally performed with panache and technical prowess. Also for an album that was recorded on a very limited budget, most of it actually sounds really great. The spirited ‘The Meaning Of Forever’ kick starts the album in confident style, and is followed by a song (‘Crest Of The Wave’) that deserves hearing by a wide audience. It is a wonderful number, with an amazing staccato riff, tremendous guitar solos and is so very, very catchy.‘In Dependence’ is a much more straight ahead rocker that really burrows into the consciousness while ‘Yesterday’ is a very capricious song with a slightly jazzy middle section and plenty to enthuse those with progressive leanings. There’s some great shredding too…’Circle Of Hate’ is another solid metal song, performed with conviction and including another blazing guitar solo and this leads onto the title track which at 7:25 is the longest on the album. Strident, multi-layered guitars set the scene here and it grows into a mid-paced song about hope. I assume that the wonderful Spanish guitar section at the end represents the gaining of a positive outcome.The obligatory ballad ‘Turn About’ comes next: a rather dramatic song with a rather Grecian feel to it instrumentally while vocally Piero Leporale goes for it as though serenading the passengers on a Vaporetto! It’s very, very strange within the context of the rest of the album. ‘Soultrip’ is a frenetic song with incessant double-kick drumming, ‘Inner God’ slowing proceedings to mid-tempo: an interesting and quite varied number with syncopated beats and a pretty good vocal performance. Closing song ‘Last Neverland’ and second longest here, exhibits all that is so promising about this debut as summarised previously. I do have to mention that the higher register singing on most of the songs could, perhaps, have gained from a “warmer” vocal style but nevertheless ‘Spadework’ is an impressively solid album that should please the power metal cognoscenti and is well worth checking out.